How do I add multiple placement employers? Students can add multiple placement employers through their Settings. 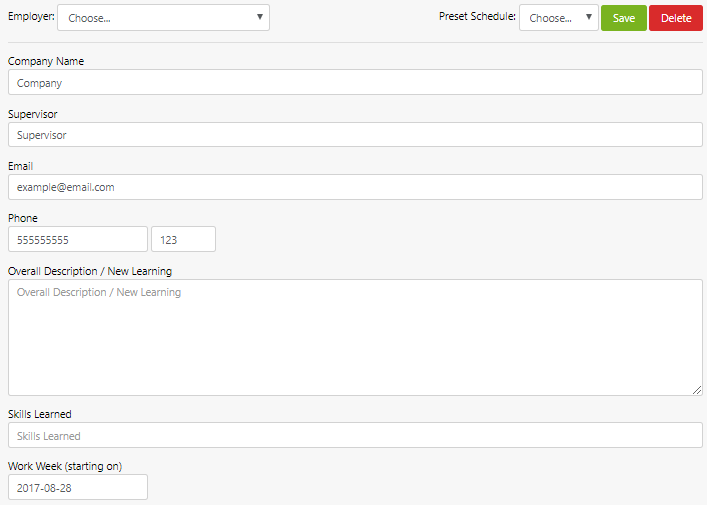 When you are writing down your hours, you will be able to select the desired employer from the employer dropdown menu. How do I add a placement employer? Students can add placement employer information through their Settings. TIP: Make sure that the email is entered correctly since your supervisor will verify hours via email. Also, remember to enter the Minimum Required Hours and current Semester on this page if you haven’t already. For information on how to add multiple placement employers, visit this FAQ post. How do I create preset logs? Students who work the same days and times every week can create preset schedules that act as templates so they do not have to keep inputting the same information every time they submit hours. Can I print off my Placement Hours? Students and teachers are able to print off individual weekly logs and have an employer sign off on the hours and activities. NOTE: You can use this method if your employer does not want to receive emails to verify hours. How do I reset my placement progress bar? NOTE: This will reset the student’s progress bar back to 0. It will not delete the previous Placement Hours. How do I edit/update my email? How do I submit a reflection/journal? Q: How Do I Submit a Reflection? How do I add placement hours? Select Skills Learned (click on drop-down arrow to view and check off skills) based on the Ontario Skills Passport. Students can also add their own skills. They just have to type in the skill they learned. How do I add a shift? Add Start Times and End Times (15-minute increments), Lunch (in minutes), check off if Absent or Late and enter Work Activities for each day of the placement, including reason for absence or lateness. Students have the ability to delete a shift by selecting Delete. 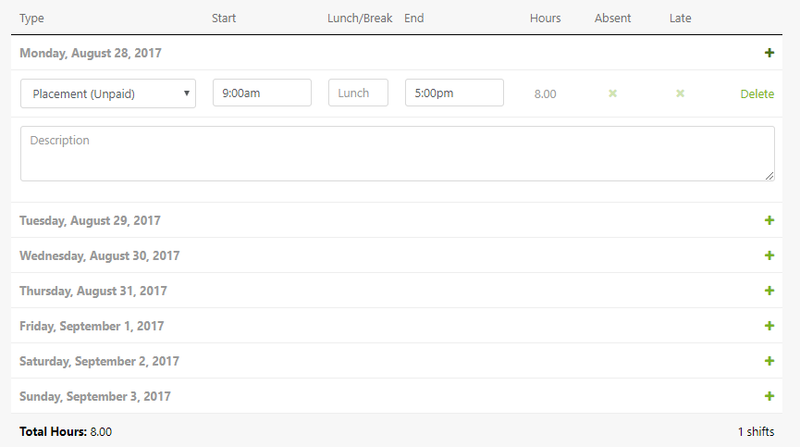 Students can also add an extra shift by selecting the + button again if a student worked more than one shift per day. When a student selects Save, then they can continue editing the form and submit it when they’re ready (e.g. students can edit and save forms as often as necessary; – hourly, daily or weekly). When a student selects Save and Approve, their employer will receive an e-mail that summarizes all the activities and the employer will have the option to verify or decline, and comment on a student’s activities. 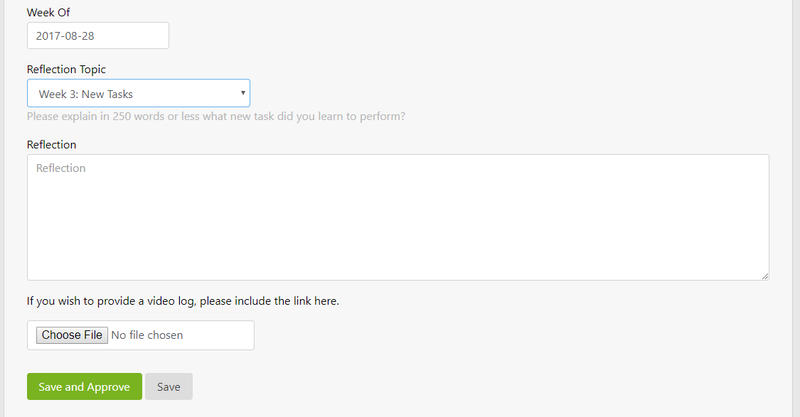 Once verified by an employer, a student’s dashboard and progress bar will automatically be updated! Absent indicates that a student was scheduled to be at their placement but were absent. This field is not to be used for a rescheduled shift or holiday. Click the Guidelines button on your Placement Dashboard to learn more about the placement program at your school board.